Sooooo comfortable! Everyone that sleeps on this in my guest rooms falls in love with it and asks where i purchased it from. AirCool Memory Foam provides exceptionalpressure relief. Due to machine-cutting manufacturing processes, there may be slightvariances in the dimensions of this product. I ordered because of the beautyrest reputation and was not disappointed. I am glad I ordered from overstock. the same mattresses in my local furniture store cost $1200 for each set and I ordered 2 sets for my sons and only paid $900 for both. I was worried about the item not having reviews but am very happy. set up of box spring was very easy. I was a little startled by the mattresses they came vacuum packed and were rolled up and almost the size of a 55 gallon drum. I carefully cut the vacuumed plastic and it opened like a life raft only without the damage. I recommend these for any person. I already own a queen size beautyrest memory foam bed but paid over $2500 for mine and am very satisfied with these. they are the exact high end quality. Purchased this bed for our guest room in a new house. We wanted to try a good quality memory foam bed, but didn't want to pay an exorbitant price. Set up was a breeze and after trying the bed out for a nap...was pleasantly surprised at how comfortable it is. 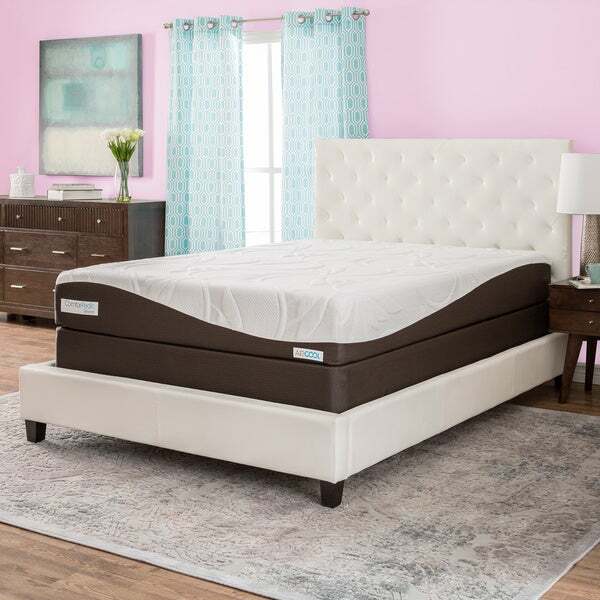 Seems a little soft at first if you are used to a firm mattress, but once you settle in it provides lots of support at all the right spots. Very comfy! This mattress set exceeded our expectations. It's high quality, at an amazing price. We ordered it for my daughter for Christmas, and it came in 2-3 days. Both boxes arrived together, and the shipping was free. I've purchased a lot of mattress sets from mattress stores, and the delivery was much more complicated and expensive, plus time consuming. I'm buying all of my mattress sets from Overstock.com from now on! I bought this for my toddler and absolutely love it! It is so comfortable and he sleeps through the night on it. Well worth the price! Great value! I love how easy it was to set up the box spring that comes with it. It took me less than 30 minutes. This is my 2nd time buying this mattress, (I bought a king for my room) and I am so happy with the result. Quality and comfort of this mattress is exceptional. I would recommend this mattress to friends is very comfortable. I was having back pain and once i started using this mattress i feel much better. At first you think it's going to be too soft, it's not. This mattress is super comfy! A favorite in our house! Easy to assemble box spring. My 14 year old built it. Bought two, one for each guest room. Box springs were easy to assemble, electric screwdriver is a big help. Guests say the mattresses are very comfortable. all of the reviews made me think this was a plush soft bed. its pretty firm. also the box spring didn't come with all of the needed parts. the bag was busted open so some screws nuts and bolts came out. Very comfy bed. Perhaps a bit too soft for my back. But my husband says its just right. I bought this for my college age son for when he comes home during breaks. I slept on it last night and would highly recommend this bed for anyone. If you're looking for a squishy soft mattress you'll like this one. I ordered it for a guest room and after one use I also ordered a tempurpedic topper to help make it firmer. You get what you pay for. I would not recommend this mattress. Nice quality for our spare room. easy to assemble, took about 45 mins. to put frame together! Love my new bed! A very comfortable mattress. Not too soft. "What is actually included in the "set" other than the mattress?" It comes with the mattress and foundation. .
"Dos this mattress have a bad smell and if so how long for the smell to fade?" "it says mattress set. So does it include the foundation?" Yes, this does include the foundation. If you prefer it without the foundation (mattress only), look at item 17942303.